Coming to Doris Duke Theater to see Ottomaticake this May? Check out Gemma speaking with Don Brown on Hawaii’s Rel Stories about the making of the film and world premiere at HIFF of Ottomaticake! Vienes a la proyeccción de Ottomaticake en Doris Duke Theater? Don Brown del programa Hawaii Reel Stories entrevista a Gemma la realización y estreno de su último largometraje documental! Doris Duke Theater/ Honolulu Museum of Art will screen Ottomaticake this May!! 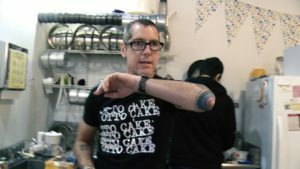 *Friday, May 4 at 7:30pm: Enjoy a complimentary mini cheesecake followed by a post-screening Q+A with Otto and director Gemma Cubero del Barrio. *Sunday screenings – 18yrs and under are free. Film is inspiring to children and youth!! *Teachers interested in bringing your class on Sunday – Contact Doris Duke Theater or Gemma at 415.630.0418. 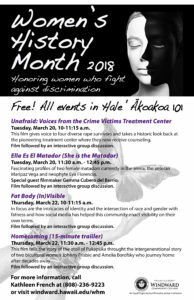 Windward Community College will celebrate Women’s History Month with a screening of Ella Es El Matador (She Is The Matador) followed by Q&A on March 20th and a special conversation with Johnny Frisbie and Gemma Cubero del Barrio on the making of Homecomimg, their new documentary in the making on March 22nd! Johnny will be sharing the process of writing “Ms Ulysses from Puka Puka” and sharing from her new novel. Unique opportunity to meet magical Johnny and get her you copy of her book signed by her :)!For information on venue and times please click on poster!Event free to the public. Everyone invited. La Universidad de Hawaii / Windward Community College celebra El Mes de la Mujer con dos películas de Talcual Films – Ella Es El Matador se proyectará con una charla con Gemma y Johnny Frisbie, una de las protagonista de Homecoming, leerá de su nueva novela y compartirá con Gemma una conversación sobre la nueva película que todavía está realizando! Más información? Pincha en la foto! March 22nd Homecoming trailer screening – 11:30am to 12:45pm. Includes Johnny’s reading and conversation with Gemma about their creative process. Open to Everyone and Free to the Public / El evento es gratis y para tod@s.
You can now rent Ella Es El Matador (She is The Matador) online! Click on “Rent” icon! Film available worldwide for a 48 hour period! Celebra el mes de la Mujer con Ella Es El Matador! Ahora puedes verla donde quiera que tengas internet sólo por $3.99! Cliquea donde dice “Rent” y tendrás 48 horas para disfrutar de la peli! 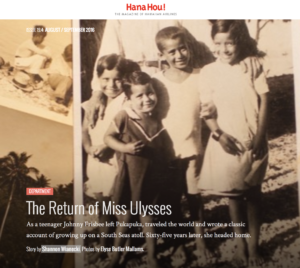 You can now enjoy the gorgeous feature article written by Shannon Wianecki for Hana Hou on Johnny Frisbie, the reprint of Ms Ulysses from Pukapuka and our Homecoming Film! Ahora ya puedes disfrutar del bello artículo escrito por Shannon Wianecki para la revista Hana Hou en la que escribe sobre Johnny Frisbie, la nueva edición de su libro Ms Ulysses from Pukapuka y nuestra película Homecoming!